(MP099). W L Wyllie (1851-1931). Pen and ink, grey wash and white heightening. Signed. These vignettes that make up the whole picture are quite delightful  Wyllie shows his considerable talent with Indian ink, lampblack and Chinese white to full advantage. In 1885 the Wyllie family moved to Hoo Lodge on the banks of the River Medway which had a commanding view of the river and from here “WL” was able to roam far and wide across the broad reaches of that river and the Thames. His fascination for all things nautical and the ever changing light and shapes that were such an essential part of messing about in boats’ clearly fascinated him and these vignettes of the Big Class and others were possibly done for commission for the Graphic magazine. 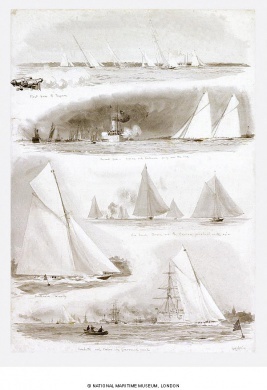 IVERNA, BRITANNIA, DOREEN, VENDETTA and CARINA are identified in pencil notes here beneath the relevant vignettes, the top one being labelled by Wyllie in pencil “First Gun to Prepare”. It is believed that this picture has been in the NMM’s collection at Greenwich since Sir James Caird bought many of WL’s illustrations in 1931 from the Wyllie family following the artist’s death earlier that year.